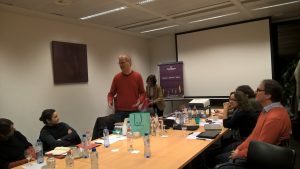 On 23 November 2016, the project Coordinator – Professor Marco Giugni – and the UNIGE team hosted the seventh LIVEWHAT Consortium meeting at in Brussels. At the meeting, the teams discussed papers which are built on findings about individual responses to crises under Workpackage 6. In addition, the teams discussed post-project publication and data exploitation plans. This project has received funding from the European Union's Seventh Framework Programme for research, technological development and demonstration under grant agreement n° 613237. SUGGESTIONS: If you have any suggestions of research projects or new publications, please let us know by sending us a note.